Keiji Inafune’s grand return to the stage. On September 13, gamers will once again have the opportunity to get their hands on a Keiji Inafune joint when ReCore releases in stores. The dystopian action platformer appears unlike anything currently on the market. In a world dominated by hard(ish) realism and down-to-earth heroes, Inafune’s newest title looks to put players firmly in the realm of fiction. Its been far too long since we’ve been able to experience a truly special Keiji Inafune creation. The man known as the father of Mega Man has seen some controversy in recent years thanks to his departure from Capcom and the subsequent troubles surrounding the development and release of Mighty No. 9, the spiritual successor to Inafune’s most famous creation. Yet, in looking to past inspirations to inform his new game, Inafune just might have stumbled upon a formula that could have a big impact on gaming’s future. 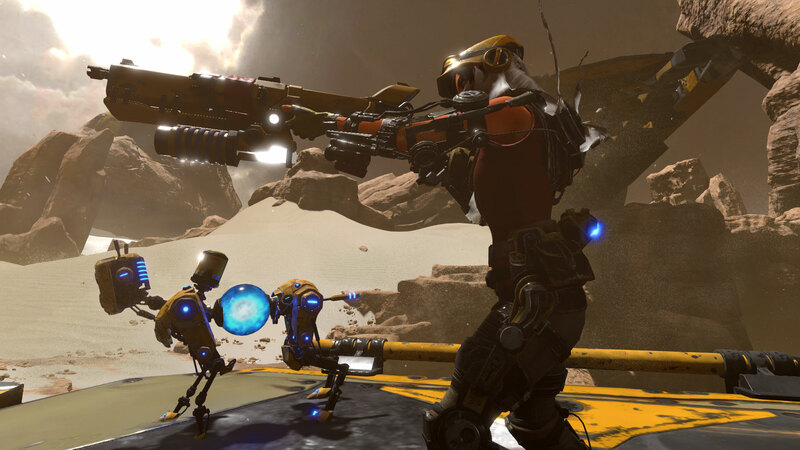 For ReCore, Inafune is going back to his gaming roots for more than just a tone, he’s also bringing old school progression to a modern perspective. Like the Mega Man series, earning and upgrading gadgets is key to the ReCore experience. Joule Adams was supposed to be on the frontline of humanity’s salvation. As one of the first explorers sent to Far Eden, her goal was to terraform a hostile world into something suitable for people. Then, something went wrong and Joule spent centuries in suspended animation, only to wake up on a world that’s dead set on murdering her and extinguishing the last vestige of humanity. Mechanical monsters roam a vast, multi-tiered world. Joule is in danger of being swallowed whole unless she can rally a team of unlikely robotic heroes — each with their own distinct personality and abilities — to bring humanity back from the brink of death. In order to accomplish her lofty task, Joule will acquire a suite of abilities designed to help her navigate the hostile world. The implicit understanding, here, is that Inafune and the team at Armature Studios have decided to eschew the modern practice of rewarding players’ progression with a cut scene in favor of rewarding player progression with new toys and gameplay variations. Arguably, the two biggest triple-A platforming titles (that don’t belong to Nintendo) are the Tomb Raider and Uncharted series. While these can be loads of fun, both channel their gameplay through a world that could very well exist at the fringes of society. Lara Croft is a powerful heroine, to be sure, but her character is based in a stark reality that imbues much of her adventure with human vulnerability. Simultaneously, as adept as Nathan Drake is at squirming his way out of hairy situations, death still hovers over his head at every turn. Real-world consequences may also be at the center of ReCores story, however, Inafune and the team have made sure to place unique character designs and sci-fi landscapes front and center. That’s great, because even in the midst of dire circumstances, there’s always room for some good, old-fashioned weirdness. That’s a lesson Keiji Inafune, the creator of Dead Rising, knows all too well. Accordingly, the world around Joule is brimming with unique, but crude, organic technology that’s burst from some science fiction nightmare. So, too, where Nathan Drake and Lara Croft pursue stories bound their person, Joule is being compelled to accomplish a monumental task; she’s out to save the world. It’s a grand journey that holds the promise of eye-popping visuals alongside a classic hero’s tale that translates 8-bit optimism into the 3D world. By digging into the developer’s past, Keiji Inafune and the team Armature Studios have seemingly stumbled upon a formula that’s strikingly original in the modern landscape of video games. Joule is a heroine with an impossible task using impossible gadgets and assembling an impossible team to fight alongside her. In a genre that’s so recently been inundated with awesome because they could be real stories and heroes, it’s exciting to see a little impossibility mixed into the proceedings. Armature Studios and Keiji Inafune are set to release ReCore on September 13.